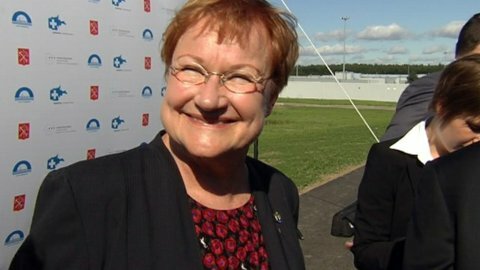 FINNISH PRESIDENT TARJA HALONEN’S REIGN OF TORMENT SOON OVER……. – The Tundra Tabloids……. FINNISH PRESIDENT TARJA HALONEN’S REIGN OF TORMENT SOON OVER……. Now it’s the faux conservative, Sauli Niinistö’s turn to torment. Yes, (addressing the TT’s Finnish conservative friends) he’s not a SDP’r, or an outright Marxist, but he’s a big government guy, who thinks that the state can, and should, in fact, play a major role in the lives of the citizens. Thanks……but no thanks. “What would we have ever done without your shattering of that ‘glass ceiling’, the election of a woman as president? Who cares that you’re a marxist statist, the important thing is that your genitalia is different (as far as I know), that’s what matters most. What an achievement, what a rewarding experience it’s been, to see you galavanting around the world trying to heal it and all. All those 3rd world deadbeat dictatorial potentates you’ve chummed with, treated as equals, has been such an uplifting experience. NOTE: Folks, if you’re for big, bloated, nanny-state government that’s not only in your bedroom, your living room, your bathroom, your kitchen, your garage, in the air you breath and the water you drink, what you purchase in the store and from the vending machine you pop a couple of coins into, then Finland should be your state of choice. Next Post Next Post GLAZOV GANG DISCUSSES THE AFGHAN KORAN-B-Q AND THE WESTERN RESPONSE TO ISLAM…….